'Education and personality'. 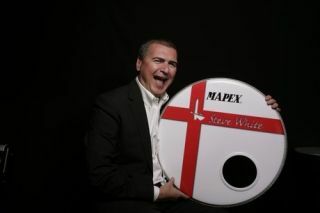 These are the key ingredients of a successful drum clinic, according to Steve White, the Style Council's legendary drummer who hosted just such an event at Jagz 'live' music venue in Ascot, Berks on 6 May. Steve drew an enthusiastic crowd to the Mapex Black Panther Clinic Tour, who cheered as he launched into a marathon solo that was a highlight of an entertaining and inspiring evening. As he attacked his shiny red Mapex kit, complete with a striking red cross design on the bass drum, he went through a gamut of influences from Buddy Rich and Louis Bellson to the latter day sounds of Oasis and The Who. But it wasn't all showman drumnastics. Indeed Steve took pains to point out he wanted to revive the educational aspects of the traditional drum clinic and handed out sheets of printed drum exercises to the audience. Among many useful tips he stressed the need for a good posture adding: "Don't slouch at the drums. Hold your shoulders back as if you are holding a £50 note between your shoulder blades!" White explained that the secret of playing fast was: "To play properly and calm down. Practise sticking single strokes with a metronome and speed will come eventually." He joked about the excuses his students give for not practising properly and explained that young drummers should aim to be individual and not just copyists at the risk of all sounding the same. "We need a young generation of drummers as individual as Mitch Mitchell, Ringo Starr and John Bonham were in their day. Remember the best rock'n'roll in the world came from the UK." This assertion was greeted with loud cheers. Picking up his sticks between expressing his thoughts and offering advice, Steve demonstrated amazing control during a workout on a solitary snare drum and back on the full kit, with Zildjian cymbals thrashing he delved into New Orleans Second Line and variations on every known beat from disco to African and Cuban rhythms. Steve was introduced by Chris Wright of Drum Wright who presented the clinic and tributes were also paid to the late Allan Ganley, the British jazz drummer who regularly played at Jagz.